The 1998 Red Sox won 92 games and captured the AL Wild Card slot. Their starting second baseman that season was Mike Benjamin. Born in Ohio but raised in California, Benjamin had been drafted out of Arizona State by the San Francisco Giants in the third round of the 1987 Amateur Draft. He spent seven seasons as a utility infielder for the Giants. He displayed a superb glove and a putrid bat. 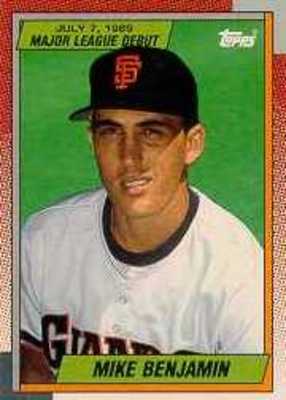 After the 1995 season, San Francisco traded Benjamin to the Phillies who let him become a free agent a year later. That’s when Boston signed him. During his first season in Beantown he was the team’s primary utility infielder, appearing in 49 games including one scoreless inning as a relief pitcher. The following year, Red Sox skipper, Jimy Williams moved John Valentin from second to third base and used Benjamin as his most-of-the-time second baseman. Mike responded well by hitting a career high .272 and committing just three errors in 911 innings of play. But it wasn’t enough to prevent the Red Sox from signing free agent second baseman Jose Offerman, that offseason. Just a couple weeks later, Benjamin was able to parlay his career season as a Red Sox into a $3.2 million four-year free agent contract with the Pirates. He retired after the 2002 season.